Our local Cambridge Health food owner has a family home in India where they keep some of their honey for more than four years to use when they get ill. Honey, if pure and well stored, does not go off. 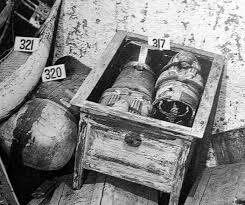 It is said that the honey found in Yuaa and Thuaa‘s tomb (lovely cool dark place) was good, after 3300 years! The ancient Egyptians were likewise fond of sweets. One of the most remarkable finds ever made by archeologists was a jar of honey, still liquid and still preserving its characteristic scent after 3,300 years, in the tomb of Yuaa and Thuaa, the parents of Queen Tiyi. Green Bay’s Manuka honey is of the best quality and packed by careful and caring producers that will ensure its longevity. The best temperature to store honey is under 5 degrees and in the near dark ( a cupboard is ideal) as light will denature the honey slightly. The ‘best before’ date that we are obliged by law to put onto the product is a date by which we estimate that the honey, if kept on a shopkeepers shelf in the light, might begin to lose quality. Over time our honey will increase in activity rating and faster at higher temperatures, however if kept in a temperature over 40 degrees C. will also start to increase the bitter flavours in the honey. The ‘best before’ date on the bottom of the jar is not synonymous with ‘use by’ date (read article from the UK Government). From February 2014, we have decided to cream our Manuka honey (article about creamed honey) to prevent the formation of large crystals that naturally occur over time if the honey is kept in a kitchen cupboard. If you do have honey that has crystallised, it is of course fine to gently warm it to melt the crystals and then keep it in the fridge, especially if your kitchen is warm. Please continue to enjoy your Green Bay honey as the years go by, whenever it was purchased; we are confident that it will be delicious.